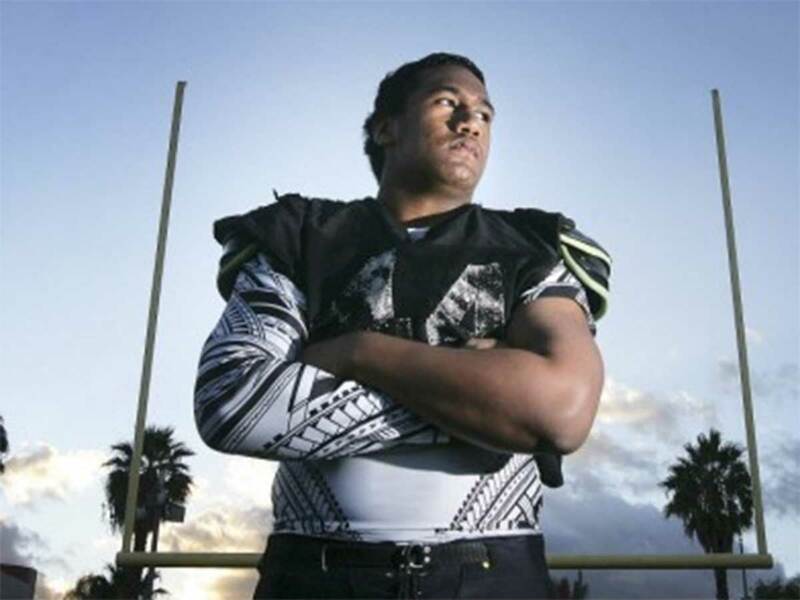 Seleti Fevaleaki Jr.–a 6-foot-2 250 pound defensive end from Corona, California–made a verbal commitment yesterday to play football for BYU (Class of 2017). Fevaleaki was offered by BYU last April. He preps at Centennial High School, where he played in seven games as a senior and had 29 total tackles (6 solo), with six tackles for loss and three pass deflections. He missed most of his sophomore season (8 games) with a broken leg, but came back to have 20 tackles (3 solo), 1.0 tackle for loss, and an interception in the Pac-5 Division championship game to seal the win. As a junior in 2015 he recorded 27 tackles (8 solo), 1.0 tackle for loss, two pass deflections, and a forced fumble. Fevaleaki is rated 3-stars by Scout and 2-stars by Rivals, but has not been rated by ESPN. BYU was Fevaleaki’s first scholarship offer, but also holds offers from Boise State, Hawaii, New Mexico, and UNLV. Centennial teammates quarterback Tanner McKee (c/o 2018) and DE/OLB Drake Jackson (c/o 2019) have also been offered scholarships to play for the Cougars. Fevaleaki is planning to serve an LDS mission prior to enrolling at BYU. Class: 2017 HT/WT: 6’2”, 270 lbs. Seleti Fevaleaki Jr. is a recruit for the BYU Class of 2017. For a comprehensive list of all of BYU’s c/o ’17 recruits and commitments click here. If you have any additional information or insight about this recruit, please include it in the comment section below.